Sovereignty of the people is the primary source from which the Constitution derives its validity. Constitutional doctrines and concepts such as the separation of power and constitutionalism therefore must be defined and interpreted to give effect to the concept of sovereign power of the people. The 1978 Constitution in Article 3, proclaims that ‘In the Republic of Sri Lanka sovereignty is in the people and is inalienable. Sovereignty includes the powers of government, fundamental rights and the franchise’. Although the 1972 Constitution expressly acknowledged the concept of sovereign power of the people (Section 3), it did not contain provisions which could have made that concept justiciable. Moreover, the 1972 Constitution does not attempt a definition of ‘sovereignty’ as the 1978 Constitution does. The 1978 Constitution provides essential links between the concept of sovereign power of the people as acknowledged in the preamble and Article 3 and the Judiciary by creating opportunities for the Supreme Court to supervise legislative and executive action which might be violative of that concept. Executive power is the power to execute the business of Government on the basis of prerogative powers or after policies have been enacted into law by Parliament. Executive power is active power and is derived from three sources namely (a). Executive power expressly conferred by the Constitution, (b). Statutory power conferred by valid legislation and (c). Prerogative power and the capacity to act in the execution of these powers. If an action is found outside the powers of the decision maker, it can be held to be ultra vires and void. These powers extend into our everyday lives and involve collection of income and other taxes, declarations of state of emergency, electoral law and many others. Sri Lankan President wields vast formal powers. The framers crafted a short Article 33 dealing with Presidential power and in subparagraph (f) of Article 33 empowered the President to perform all such acts required to be done by custom or usage not inconsistent with the Constitution. In Sri Lanka the Executive has two components: an elected executive and an appointed executive. The President and Cabinet of Ministers comprise the elected Executive while they are assisted by the appointed executive – the public servants. 17th Amendment to the Constitution introduced in 2001 effected the requirement for the President to act on the recommendations of the Constitutional Council in appointing to high offices and Commissions. The 18th Amendment to the Constitution on the other hand paved the way for greater presidential autonomy in the field of appointments. It replaced the Constitutional Council of the 17th Amendment with a new Parliamentary Council. Accordingly the President could seek the ‘observation of the Parliamentary Council in making appointments to key governmental positions, but was not bound to take their advice. The 19th Amendment to the Constitution effected in 2015 again introduced the Constitutional Council to replace Parliamentary Council to limit the vast powers of the President to a certain extent including several other changes. One opportunity for the Supreme Court to give effect to the concept of ‘Sovereignty of the People’ arose in the context of the Land (Amendment) Bill. The Bill, according to the Supreme Court, was admittedly not a constitutional amendment which was seeking to subject the power of the President to the advice of the relevant Provincial Council, to the Ministers recommendation and the Ministers opinion by virtue of an ordinary Bill. Article 33(d) of the Constitution confers power on the President ‘to ….. make such grants and dispositions of lands vested in the Republic as he is by law required or empowered to do……’ Sections 3 and 5 of the Land Grants (Special Provisions) Act and Article 27 of the Land Development Ordinance empowers the President to make such grants and dispositions of lands as constitutionally decreed in Article 33(d). Clause 4(3) of the proposed Bill sought to qualify that power in the hands of the President, in that, upon the Minister (of lands) recommending that, a grant or disposition be made, the President was obliged (by the use of the word ‘shall’) to make an absolute grant, the President’s constitutional power being in effect transferred to the Minister. Consequently, the contention on behalf of one of the petitioner’s who challenged the constitutionality of the Bill on the basis, that, the proposed clause was not only obnoxious to Article 33(d) of the Constitution per se but also repugnant to Article 4(b) of the Constitution which in its wake attracted Article 3, (an entrenched provision in terms of Article 83(a) of the Constitution) for which reason a Referendum would be required for the Bill to become Law, was upheld by the Supreme Court and the proposed Bill could not therefore be passed into law. This Supreme Court determination will stand as one upholding the concept of Sovereign Power of the People enshrined in Article 3 in the context of executive power, thus acknowledging the material and justicible content of that concept. Another decision which examined the position of the Executive related to Third Amendment to the Constitution Bill. The Bill which was actually passed as the 3rd Amendment to the Constitution changed the duration of the President’s term of office from a fixed term of six years to a flexible duration where the President (during his first term of office only) could call a Presidential election any time after completing four years in office. Under Article 83 of the Constitution it was only an extension of the President term beyond six years that required a Referendum. The President of the Republic shall be elected by the People, and shall hold officefor a term of six years. Article 31(3) of the Constitution provides that ‘the poll for the election of the President shall be taken not less than one month and not more than two months after the expiration of the term of office of the President in office’. By the relevant Bill, it was sought to vest the incumbent President with a discretion at any time after the expiration of four years from the commencement of his first term of office, by proclamation, to declare his intention of appealing to the People for a mandate to hold office, by election for a further term. The Bill after being gazetted was tabled in Parliament on August 3, 1982, that was, shortly after the first executive President of Sri Lanka under the Constitution had completed four years in office. 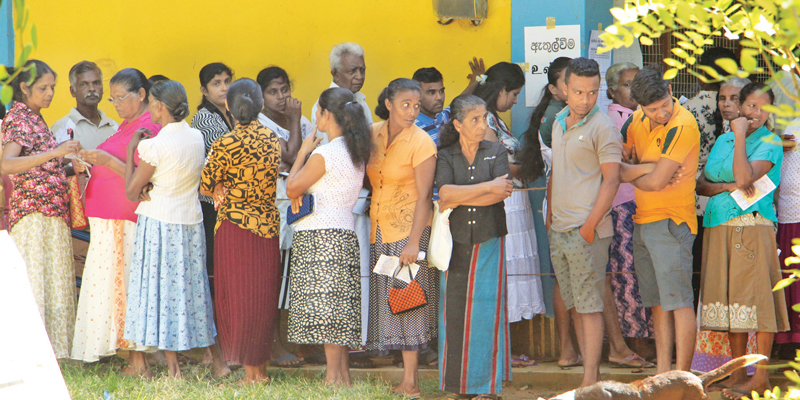 A number of petitioners, the Civil Rights Movement of Sri Lanka being one of them, challenged the Bill by invoking the jurisdiction of the Supreme Court under Article 120 of the Constitution. The thrust of the argument for the petitioners was that the proposed amendment by seeking to reduce the period of tenure of office of the President impinged on the executive power of the people and on their franchise as contemplated by Article 3 read with Article 4(d) and (e) of the Constitution. In other words, the contention was that the proposed amendment sought to jeopardize ‘the sovereign right of the people to determine the tenure of office of their executive – delegate…….’ It was thus contended that Parliament alone was not competent to alienate the People’s Sovereignty in this way and a Referendum under Article 83 had to be sought for that purpose. By reducing the period of office from six years to four years Parliament is not cutting down the period of office of the President. What it seeks to do is to empower the President to appeal to the people for a mandate to hold office prior to the expiration of his term of office, prescribed by Article 30(2), after the expiration of four years from the commencement of his first term of office. The President is thereby enabled to limit, of his own choice, his term of office. There is no compulsion on him to vacate the office at the end of four years. It is thus left to the discretion of the President who has been elected by the people to voluntarily cut short his period of office and seek a fresh mandate from the people. The determination of the Supreme Court in this case with respect to the second term of President Chandrika Kumaratunga is one of the most controversial decisions made by the Supreme Court in recent times. As noted already, the Third Amendment to the Constitution vested on the incumbent President the discretion at any time after the expiration of four years from the commencement of his first term in office, by Proclamation, to declare an intention to appeal to the people for a mandate to hold office, by election, for a further term. In the latter part of the year 1994 President Kumaratunge was elected to the office of President. Consequently, on a plain reading of Article 30(2) of the Constitution, she was entitled to hold such office for a term of six years, which would have taken her incumbency till the year 2000. However, having stood for election for a second term in the year 1999 and having been re-elected, the question was, whether she would be entitled to hold the said office only until the year 2005 on a plain reading of Article 30(2), or was she would be entitled to go on till the year 2006 by reason of the fact that an affirmation of office had been administered to her by the Chief Justice, albeit without much publicity, in the year 2000. The constitutional provisions that came in for interpretation in this case was Article 31(3A)(d) (i) of the Constitution which was introduced as a sequel to the main provisions of the Third Amendment to the Constitution. (i) is the President in office, hold office for a term of six years commencing on such date in the year in which that election is held (being a date after such election) or in the succeeding year, as corresponds to the date on which his first term of office commenced, whichever date is earlier……. The first date referred to in the sub-paragraph is the date of the election. It is only with reference to the date of election that the other date as corresponds to the date of the commencement of the first term of office is fixed. If the corresponding date is therefore the date of election, it is shifted to the succeeding year. If the corresponding date is after the date of election it would remain the year of election itself. Applying these principles to the case at hand, the Supreme Court concluded that as the date of the election was December 22, 1999, the first term of office commenced on November 10, 1994. The corresponding date fixed according to the formula in the sub-paragraph would be November 10, 2000. Hence, as between these two dates, the earlier date is December 22, 1999, and accordingly the second term of office of President Kumaratunga would come to an end six years from that date, namely on December 22, 2005. Although the judgement of the Supreme Court has come under criticism it is submitted with respect that, in the context of the concept of sovereign power of the people, given its self – contained nature, combined with the concept of political power, it may be argued that the determination of the Supreme Court in effect holding the President Kumaratunga’s second term stood terminated in 2005 and not 2006 furthered the concept of the ‘Sovereignty of the people’. The cardinal principle embedded in democratic governance is that people shall have their sovereignty with them which is inalienable to a coterie of rulers. This necessitates the assurance of the prevalence of the substantive safeguards in the Constitution to forestall any deterioration of the liberty of the people.